Thanks to my weekly CSA delivery service, I have enough tomatoes to feed an army. But only if the army is really, really hungry. At times like this, I turn to my bff Pinterest. 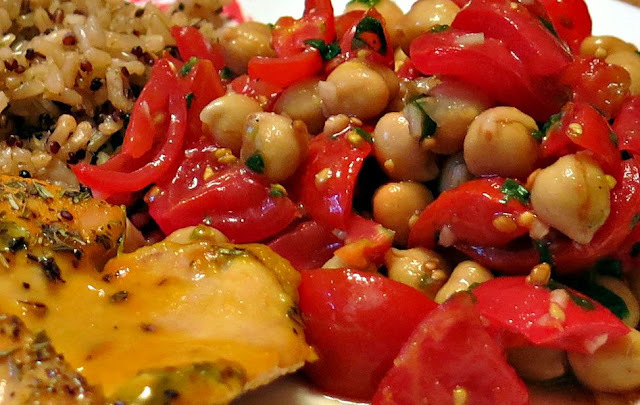 That's where I found a terrific recipe for a delicious and simple Tomato and Chickpea Salad on Rachel Schultz's "A Household Almanac" blog. I recently served this salad alongside another of Rachel's creations which she calls the "World's Best Chicken," and which I call Desperation Chicken because, together, these two recipes saved my life. Well, they saved dinner one night when I forgot to cook. Or shop. a bit of salt and pepper, of course. Just mix all these ingredients together and refrigerate at least 20 minutes before serving. Delicious! 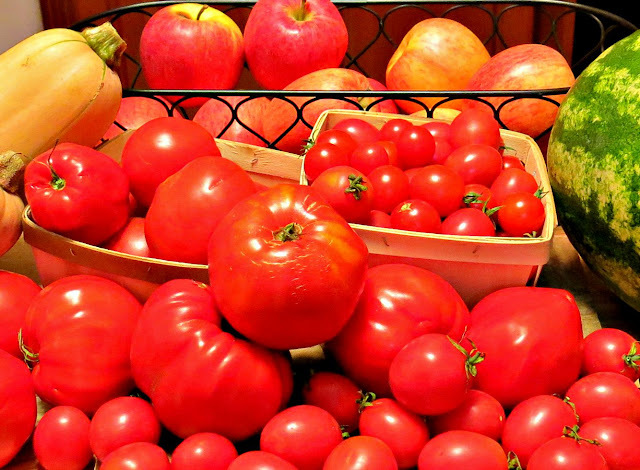 What is your favorite way to use a bounty of fresh tomatoes? 1. Chop the tomatoes into slices or quarters. 2. Add tomatoes, chick peas, basil and garlic to a bowl. 3. Mix the remaining ingredients and add to the bowl. I have too many as well. This sounds like a great recipe. Thanks for sharing at My Flagstaff Home! Thank you for hosting a great party, and I'll see you again soon. 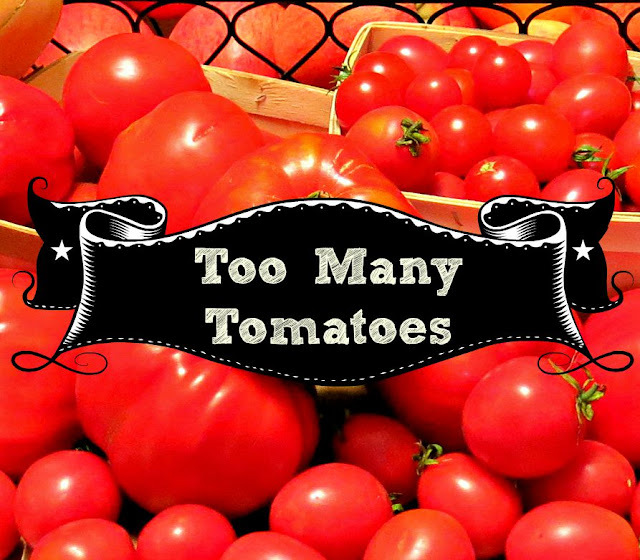 There's no such thing as too many tomatoes! Thanks for sharing your recipe with us at Share The Wealth Sunday! Not if you have a few good recipes! Thanks for letting me join your party, and I'll see you again next week! Yum! Tomatoes and chickpeas. This sounds like a great side, especially to pair with a veggie packed sandwich on a picnic. I don't know why, but that's exactly what this salad makes me think of! Thanks for linking up to the Sunshine Life Link Up! Your recipe finds are fantastic! 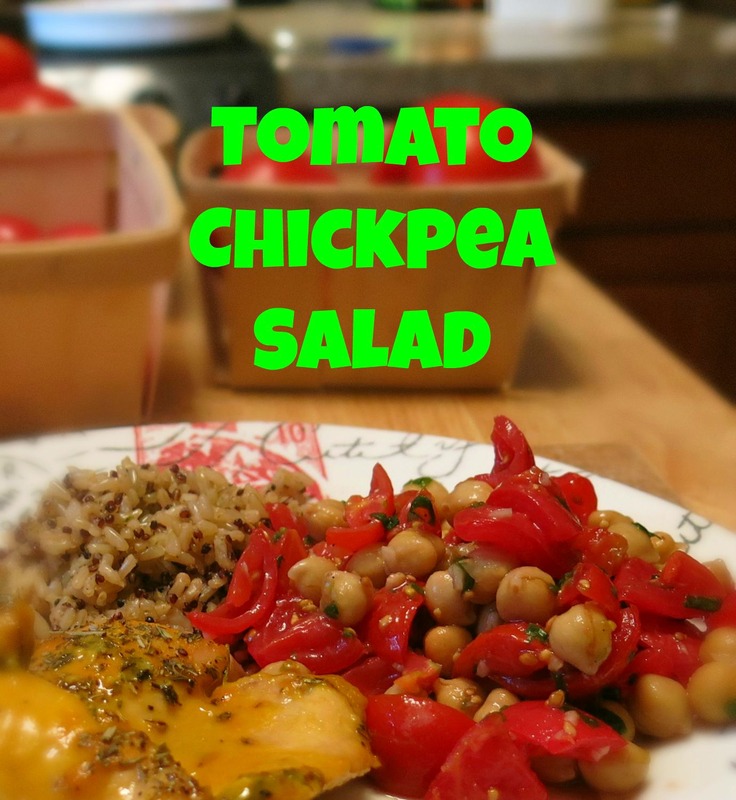 Your Tomato and Chickpea Salad is featured on Full Plate Thursday this week. Hope you are having a great day and enjoy your new Red Plate!